Elliott wave analysis is mine. Looking at the chart, one can convincingly conclude that it is possible to chart the path of the NSE using Elliott Waves. For those interested in learning the waves you can read ELLIOTT WAVE PRINCIPLE: KEY TO MARKET BEHAVIOUR BY Frost and Prechter. You can get the entire book free and alot more from www.elliottwave.com. It is instructive to note that Prechter and Frost, in the book, predicted the great bull market from 1979 (i.e the DJIA). To date the American market has far exceeded even their own expectations. Prechter won the U.S Trading Championship in 1984 with a record 444% gain. Prechter is currently researching on social causality via the Socionomics Institute. This chart shows a 5 wave move from the low of Sept. 2002 (1009 points) to the high of Jan 2007 (6026 points). Note the zigzag in wave IV and the triangle in wave four of wave V.
This five wave move is called an Impulse Wave. I don't have data from before 1998 so I guess this is a fifth wave move of a much larger impulse wave. A fourth wave usually divides an impulse into a Golden Section. From the low of Sept. 2002 to the high of wave III (at 3176) is a gain of 2167 (i.e. 3176-1009). Wave V has a gain of 3558 points (i.e 6026-2468). (3176-1009) X 1.618 = 3506 points. Wave V had a gain of 3558 points i.e 6026-2468. The difference btw the two figures (3558 vs 3506) is 52 points which is one and half percentage points from the exact figure! 1. From the high of 6026, the NSE 20 Share index has fallen in five waves (i.e waves 1, 2, 3, 4 and 5). 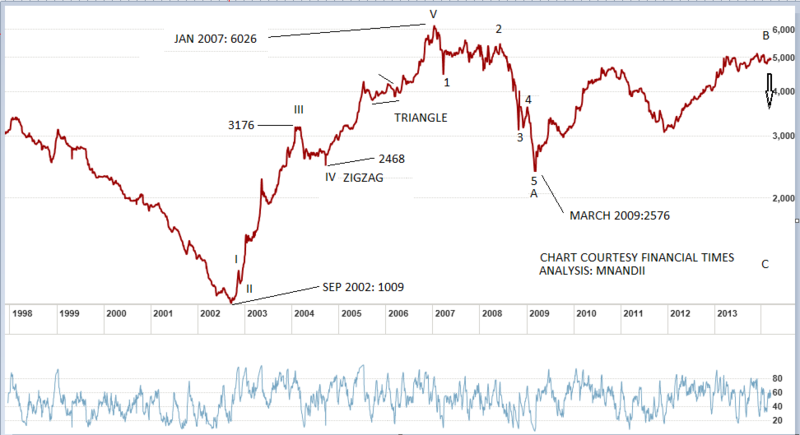 From the low of March 2009 (at 2576 points), the NSE has moved in 3 waves. Or, at the very least, the move from the part I've labelled A to the part labelled B cannot be considered an impulse wave due to overlap. 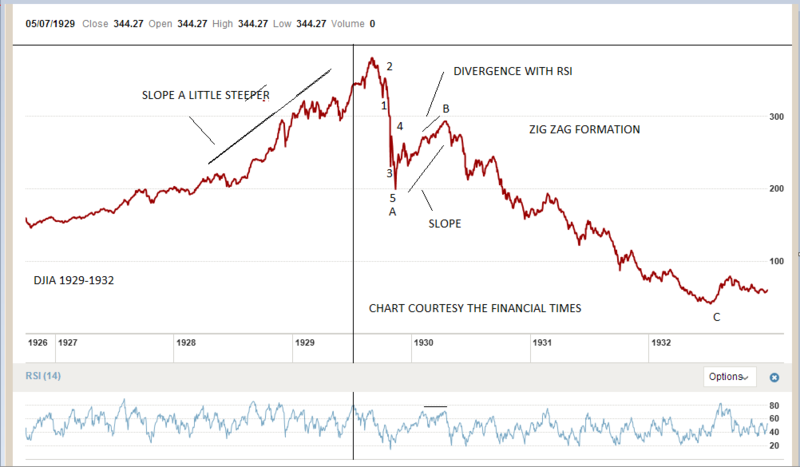 The Elliott wave pattern that has such characteristics is called a ZIGZAG. A Zigzag is a three wave move that subdivides 5-3-5. So presently we have 5 waves down from the 6026 high, thus forming wave A. Wave B is the three wave move from the low of March 2009 at 2576 to present levels. What remains is another five wave down which is likely to take the 2576 low!!! 2. Also note the DIVERGENCE between the RSI and the highs that the NSE is making presently. 3. From the low of Sept. 2002 to the high of Jan 2007 NSE had a gain of 5017 (i.e 6026-1009) points over a 5 year period. From the low of March 2009 to presently, the NSE has only gained about 2497 points (i.e 5073-2576) over a 5 year period. This is about half the gain of 2002-2007. So we now have a market which shows weakness in breadth apart from not making a new high beyond 6026 points. 4. Economically Kenya has one of the highest taxation levels with little efficiency. Electricity prices are high etc etc. Our debt obligation, though not necessarily un-manageable at this point, has accelerated over the past few years. Alot of grand projects are being announced which appear to be good news. In Elliott analysis complacency usually reigns at the very top of a move. NSE 20 Share index is over-extended and it is time for a big correction in the market. Good analysis. I expect a move lower but not to the lows of 2576. The correction might be there, but i doubt if it can be as big as you may want to put it..
Don't Work for Money, Let Money Work for You..
Another TA view showing the toughness of the 5000 level, which has stalled upward progress since Nov 2013. @mnandii - thanks for the EW count. If this count is right on the long term timeframe, then its possible for 3000 to be tested. The market has run out of bargains. $15/barrel oil... The commodities lehman moment arrives as well as Sovereign debt volcano! Sell your holdings and wait for the prices we last saw in March 2009. In other words the nse will fall by 47%. @mnandii - the low in march 09 was at 2300 level otherwise it conflicts with the yr 2004 lows. Are you guys saying regardless of how the economy is managed,the Nse will always stick to that script? I don't think so. There will be a correction but not as significant as 2009. @obiero, your dreams are valid. So 2576 appears too low? Ok, this is the scenario that should play out. In 1997 the value of the Shilling was much higher than it is today. At least back then if you had Sh 10,000 you could buy alot more stocks than you can with the same amount today. i.e the value of the same has depreciated. A lot. So the hypothesis goes that as we enter the era of deflation, the value of the shilling will rise and if you have Sh 10,000 your ability to BUY stocks (or any other good) will increase substantially. What may be seen as the fall in the price of stocks (or other items for that matter) is actually a consequence of deflation (i.e the rise in the value of the shilling). So, in essence, the market can and will fall by more than half the present levels. Look at this one from 1929-1932. The great depression. Notice especially how a price which has no momentum behind it almost always leads to a fall. Yes. The script is waves of emotion. You see, all financial markets follow the pattern of human social mood. When people acting collectively have a positive mood, the same is reflected in how they act. So they push the price of the market up. When social mood becomes negative the price of financial iinstruments fall. So the stock market is a gauge of social mood. And this discussion brings us to social causality. Events outside the market (interest rates, wars etc ) do not determine the path of the market. When CB change rates they are only REACTING to the market! E.G. How comes CB forecasts of the rate of growth are never met? And we continue to trust their ability to determine how the economy fairs? Social mood determine the direction of the market. True. 2361 according to my data feed. And yr 2004 low was a fourth wave! So the fall from 6026 found support at the previous fourth wave of one lesser degree. From Elliot this is the guideline of depth of corrective waves. Now. Elliott states that the 'B' wave of a zigzag usually retraces between 38-79% of wave 'A'. From the all time high of 6026 to the low of wave 'A' is 3665 points (6026-2361 =3665). From the 2361 low to the present high level of 5073 is 2712 points (5073-2361 =2712). So 'B' has retraced 'A' by about 74 % currently. i.e (2712/3665) X 100% = 74%. Like the developed markets, we should have sentiment measures. These indicators are good at measuring the mood of the market i.e how much bullish or bearish the market is. Also short selling the market is a long overdue requirement. There was a share split you say? That has been factored in the social mood. Why is the market struggling to rise? Enjoy the dividends and the bonus. From the look of things it might be the last one in a very long winter. I say 'might'. The path will become clear as the waves develop. @Mnandii this is a theory and i am sure there are critiques to the theory. My theory is that the so called boom & bust economic cycles are not inevitable paths but are triggered by the financial industry through monetary expansion & contraction cycles. Where are the bulls? The bullish arguments are lacking... I prefer bear setups where bulls are still thumping their chests for a proper discount window.